The Buddha is believed to be the ninth incarnation of Lord Vishnu because of His greatness, wisdom and compassion for all human beings. Considered to be the founder of the Buddhist sect, Hindus even today undertake pilgrimages to Bodh Gaya and make obeisance to Lord Buddha. A few non-Hindu Western scholars hold the view that Buddha was a Hindu reformer. Kings in Nepal have been revered by their Nepalese subjects as forms of Vishnu many times. In the ‘Satapatha Brahmana’ Buddha is acclaimed as the ninth avatar of Vishnu, holding the promise of salvation or nirvana, in the Kali Yuga. Another school of thought opines that Balarama, foster brother of Krishna was the ninth Avatar of Vishnu. However there is a conflict as some believe Balarama to be an incarnation of Sheshnaag ( the thousand-headed snake on which Vishnu reclines throughout periods of dissolution of the world.) 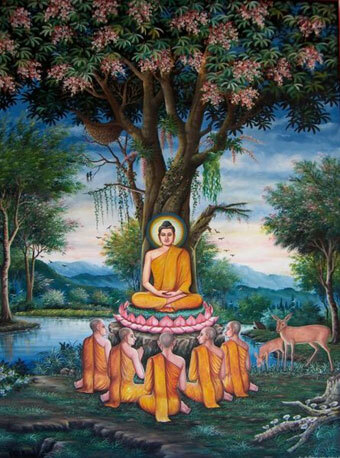 Buddha as the ninth incarnation gained popularity because of the success of Buddha’s teachings amongst common folk. To the Shakya King in Kapilavastu is born Gautam Buddha, a Prince among Princes. Abandoning his princely life, Buddha discovers the means of salvation through intense meditation. Once enlightened, he preaches his first sermon ‘The Turning of the Wheel of Law’ at Sarnath near Banaras. Providing a simple meaning to human existence and its goal, he admonishes the Brahmanical orthodoxy of his times. Buddhism emerges as an organised religion, in the prosperous age of the mighty Kshatriya kingdoms along the Gangetic plain. The birth of Pince Siddharth was a significant event in the history of mankind. He was born in 563 B.C. to King Suddhodana and Queen Maya in the royal grove of Lumbini between Devadaha and Kapilavastu. He belonged to the Sakya clan of the Kshatriya caste of the solar race.. On the full moon day of Vaishakh 544 BC, Queen Mahamaya was journeying from the capital Kapilavastu to her parents in Devdaha. She stopped under the shade of two sal trees at Lumbini and gave birth to Buddha. Their kingdom Kapilvastu lay between the Nepalese foothills and the river Raptu. The child was named Siddhartha. But even after enlightenment he was better known by his clan name— Gautam the Buddha. He was brought up by his mother’s sister, also his stepmother as his mother died soon giving him birth. On the fifth day of the prince’s birth, the naming ceremony was performed with a prediction that the new born would be either a universal monarch or Buddha, the supreme enlightened one. Shocked by this prophecy, King Suddhodana enquired, "What will my son see that will be the occasion of his forsaking the household life?" The soothsayer said, "Four signs of a man worn by age, a sick man, a dead body and a hermit". Gautam was a serious-minded child who instead of playing with other children often sat alone, lost in his own thoughts. Though Prince Gautam was a Kshatriya, he never hunted and instead tried to protect animals and birds. The King provided his son with all possible luxuries along with the best of education, taking care to protect him from any negative sight. In his youth, Prince Siddhartha married Princess Yasodhara who bore him a son, named Rahul. The king, had three palaces built for him, and at the age of sixteen gifted him forty thousand dancing girls. Yet thirteen years later Gautama left the mundane world in quest of, "The incomparable security of Nirvana free from birth and endless reincarnation." During one of his excursions, Siddhartha sighted four incidences which made him aware of the harsh sufferings of life. He saw a frail man weary from age, a diseased man, a starving beggar and a dead body. The events forced him to search for the ultimate truth that eventually changed his life. At the age of twenty-nine, he abandoned his home in search of the answers to his questions, leaving behind his wife and son, his father and a crown of power and glory. After leaving his homeland, Siddhartha made his way to the hermitage of renowned sages of that time. But found these teachers' range of knowledge was insufficient. He followed the path of self-mortification for six years but could not attain his desired goal. Soon realizing the futility of such an endeavor which had weakened him, he took nourishing food. A woman Sujata offered him kheer and a grass cutter gave him a stack of grass to sleep on. Then he began intense meditation until he came to know the absolute truth. He meditated under the Bodhi tree in Bodhgaya at the edge of the river Niranjana, in the present state of Bihar in India. At the end, in just one night of Vaishakh(C. 528 B.C. ), Siddhartha came to know about his previous lives, the cycle of birth and rebirth and how to end infinite sorrow. Siddhartha became Buddha or the Enlightened One on his thirty-fifth birthday. He then spread the message of practicing ahimsa or non-violence and detachment from worldly desires, for attaining inner-peace and true knowledge for the next forty-five years. He taught as the Buddha or Shakyamuni (the sage of the Shakaya). His teachings formed the basis of the Buddhism religion. At a time when people were losing faith in humanity and religion while sinning along with violence and greed was commonplace, Buddha brought with him peace for mankind. This incarnation reflects the intellectual and spiritual progress of human civilization. From Gaya, the Buddha proceeded to Sarnath near Varanasi. Here five men became his disciples. Teaching them the truths he had discovered, he formed the first sangha or order of monks. Thereafter, he journeyed extensively, preaching truth and gained a large following comprising of scholars, sanyasis, kings and ministers. His day was divided between itinerant preaching in the morning and receiving visitors for discussion at night, with the afternoons reserved for private meditation. He also went home as a bhikshuor monk. His father, stepmother, wife and son joined his sangha. In 483 BC, on the same day that he was born, and had attained enlightenment, the Buddha attained Nirvana, as he was freed from birth and endless reincarnation. His death or parinibbana occurred around the age of eighty. Shortly before his death, Gautama assembled the members of his order, giving final instructions. "Look not for refuge to anyone besides yourselves." 2. All suffering is caused by human desire and clinging to existence. 3. Getting rid of worldly desires is the end of suffering. 4. To be delivered one must follow the eightfold noble path etched by the enlightened one. "Original Buddhism is atheistic, though the gods of Hinduism or Brahman were not explicitly denied, but nowhere did Gautama affirm that a transcendent deity should be invoked or his existence be formally acknowledged." He was strongly opposed by the Brahmins for teaching that gifts to the Buddhist order were of more merit than sacrifices practiced by Hindus. The number of Buddhists in the world ranges "from less than two hundred million, to more than five hundred million, with the lower number closer to reality." Buddhism flourished during the reign of King Ashoka (274 - 232 B.C.). "In the 2nd century before Christ, King Kanishka sponsored a fourth religious council at Kashmir where two radically different concepts of Buddhism, became known as Mahayana (great vehicle) and Hinayana (small vehicle)." The relics of Buddhist saints came to be worshipped, images of Buddha were objects of veneration, monasteries were opened and Buddhism was transformed from an exotic cult to a religion of the many. "Until the rise of the Gupta dynasty around 320 A.D., Buddhism fairly held its own in India. But under the Guptas, Hinduism became dominant. Buddhist religion was absorbed into the Hindu tradition which made Buddha an incarnation of Vishnu. "Two types of Buddhism are easily recognized: the Mahayana in China, Japan, Korea, Vietnam, Tibet, and Nepal; the Hinayana in Thailand, Burma, Ceylon, Cambodia, India and Indonesia." "Hinayana professes to follow the basic principles of the Pali canon is identified with primitive Buddhism. Certainly its emphasis on the four Noble Truths and the Eightfold Path places it nearer to the original teachings of Gautama. Hinayana denies any god outside and above man and so logically concerns itself only with self, which it seeks to spare the trial of continuous rebirth by Nirvana annihilation." Man seeks salvation or nirvana. The teachings of the Buddha are solely to liberate human beings from the misery and sufferings of life, a universal aspiration. Rich and poor alike were attracted by the simplicity of Buddha’s teaching and his emphasis on complete equality of all, antithetical to the existing Hindu caste system. - His enlightenment in 588 BC. - His attainment of Nirvana or the complete extinction of self at the age of 80. Pilgrims come from the world over to Bodh Gaya for attending the celebrations. The day is marked with prayer meets, sermons on the life of Gautam Buddha, religious discourses, constant recitation of Buddhist scriptures, group meditation, processions, worship of Buddha’s statue and symposia. The Mahabodhi Temple wears a festive look, festooned with colourful flags and flowers. Buddhists refrain from eating meat and eat kheer or rice cooked in milk and sugar, sharing it with the poor. They set up stalls in public places to offer clean drinking water and show kindness to animals. Sarnath and Bodhgaya are two of the most important pilgrimage centres for the Buddhists.